The report says Parliament should approve the Airports National Policy Statement (NPS), after Government addresses the concerns it sets out, which include air quality, surface access, scheme costs and airport charges, and noise. a written commitment of policy support for Southern and Western Rail Access be made by the Government in the NPS. more detail on proposed changes to the M25. that a condition be included in the NPS that airport charges be held flat in real terms. the Government’s proposal for a six and a half hour night-flight ban be extended to a minimum average period of seven hours. Government now has the opportunity to make changes to the NPS, before it is laid before both Houses of Parliament for debate. The Committee accepted there is a case for additional runway capacity, particularly hub capacity and that expansion at Heathrow could deliver the Government’s strategic objectives for greater connectivity for passengers and freight. They recognised the efforts made by the Government and Heathrow Airport to mitigate the significant social and environmental impacts arising from expansion at Heathrow. They say additional safeguards are needed to ensure that the interests of passengers are protected, and the adverse environmental, social and health impacts on affected communities are addressed. The Committee also identified associated policy measures that were required if expansion at Heathrow was to be delivered effectively, including policy on airspace change, wider Government policies on air quality, noise and surface access improvements, and effective use of existing airport capacity. The Chair of the Transport Committee, Lilian Greenwood MP, said: “The Committee’s recommendations improve the NPS and reduce the chance of a successful legal challenge. Neil Carberry, CBI Managing Director for Infrastructure and People, said: “Improving the UK’s infrastructure really has to be at the heart of our industrial strategy, if it is to have the desired effect of giving the British economy a shot in the arm. Heathrow Southern Railway welcomed the call for greater clarity on surface access improvements contained in the report, which notes that schemes such as Southern and Western Rail Access are important for a two-runway Heathrow even before a three-runway airport is developed. The report recommends a written commitment of policy support for Southern and Western Rail Access be made by the Government in the NPS, along with the provision of clarity around funding and the timeline for delivery, which schemes are needed to support current two-runway operations at Heathrow and which are needed to support an expanded Heathrow. 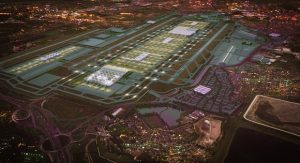 The report also calls for the UK Department for Transport’s updated surface access modelling to be published so that the likely impact on road and rail congestion of a new North West Runway at Heathrow scheme is known.